lake of shining waters: WHY DO I STITCH? 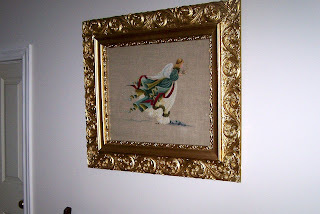 Your cross stitched pieces are amazing, Marion! They are just breathtaking! I love how you find the perfect frame for each piece, too. I can totally see the time it would take to complete some of your pieces. And I totally understand why you don't do it for everyone. I have gotten to the point where I only make items for those that I know will truly love and appreciate them. I made too many items that were tossed aside and it hurt because I put so much time and effort into them. They have NO clue all the hard work that the pieces took or how much love you put into them. Beautiful work Marion. I love the story of the Lavender and Lace Angel. I bet she is very special. 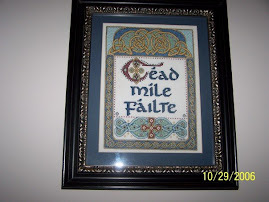 Would you still have the Cied Mille Failte pattern or a designer to look for a copy for myself. As a fellow East Coaster it is very meaningful to me as well. I so understand why you cross-stitch! Your pieces are treasures! 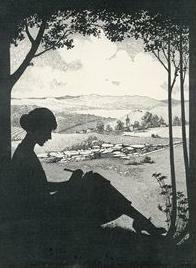 I plan to do a post and show some of my work here in the next couple of weeks! Your inspiration is rubbing off on me! For me, there is no such thing as a quick stitch. I am all thumbs! I enjoy admiring yours though!